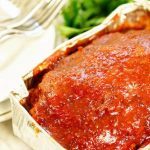 Delicious Pressure Cooker Meatloaf is a snap to make and so easy! Juicy and tender making pressure cooker meatloaf is quick. It's the easiest way to enjoy this classic comfort food! 1/2 lb. Italian sausage mild or spicy, use your favorite! Add the remaining ingredients and mix together well but do not over-mix. Form a small pan with tinfoil (or use a small aluminum pan my personal choice), ensuring the pan will fit into your pressure cooker. Shape the meatloaf into pan. Add two cups of water to the bottom of the Instant Pot. Place the trivet in the bottom. Place the pan with the meatloaf on top. Add the lid and seal. Set timer for 45 minutes. Quick release at the end. Prepare the sauce. After the meatloaf has completed cooking in the Instant Pot, slather the top with the sauce. Place under the broiler for 3-5 minutes or until it's toasted. Enjoy! !